If you can’t make it to the Garden—let us come to you! The Missouri Botanical Garden's Education staff offers outreach options for Early Childhood classes. These programs are standards-based and easily extendable to fit seamlessly with your classroom curriculum. The EarthWays Center also offers sustainability-focused outreaches for those schools wishing to schedule presentations on recycling, energy and conservation. Early Childhood Outreach Programs may be scheduled year-round between 9 a.m. and 4:30 p.m. Programs last between 45 and 60 minutes. Pricing is $100 per class of up to 20 students, $50 for additional classes conducted on the same date in the same location. A maximum of three outreach programs may be scheduled on a single day. The EarthWays Center offers a variety of sustainability outreach programs for students in grades K–12. Students will not only deepen their understanding of the selected topic, but will enhance process skills important to both science and math. Please call (314) 577-0207 for more information or to schedule a sustainability outreach program. 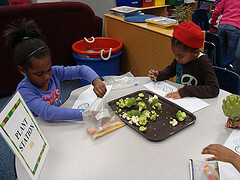 Ask about bringing the EarthWays Center's longer-term sustainability programs to your school. Learn at Our Other Sites! Check out field trip opportunities at the Sophia M. Sachs Butterfly House in Chesterfield, Missouri or the Shaw Nature Reserve located in Gray Summit! Join us for a full-day field trip that combines a guided forest ecology program and an unforgettable climbing experience!